Chase your adventures in style and comfort while still thinking environmentally with the dynamic 2019 Toyota Prius. The instantly recognizable aerodynamic design of Prius goes beyond sleek styling to offer you an exhilarating, reliable, and efficient drive. 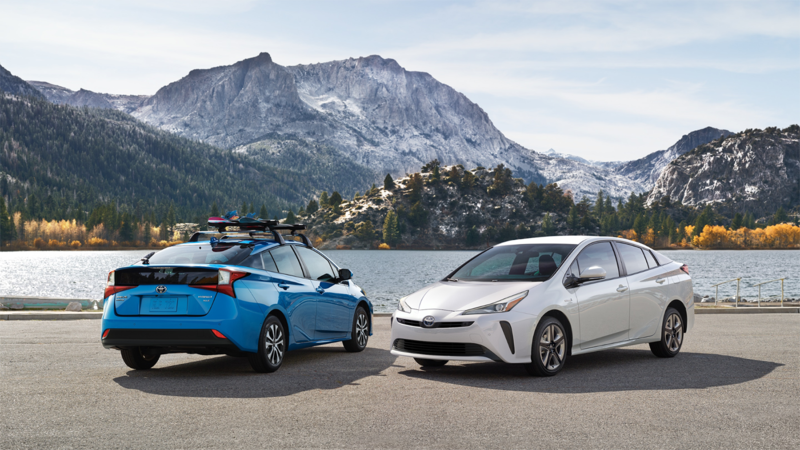 Take on rain, snow, and dirt with the newly-available AWD-e system, offered for the first time on Prius models. 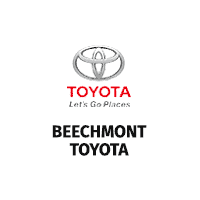 Experience legendary efficiency from Toyota’s Hybrid Synergy Drive® system which contributes to the exceptional 54 MPG city fuel economy rating for the 2019 Prius**. Inside, you’ll be greeted by a tech-focused interior that offers an available 11.6-inch HD multimedia display, complete with familiar pinch, zoom, and tap capabilities that let you access your favorite media. Fold the 60/40 rear seats down to reveal up to 65.5 cubic feet of total cargo space, meaning that even your biggest toys can come along for the journey. No matter your destination, you can count on the 2019 Toyota Prius to get you there efficiently and in style. The biggest change to the Toyota Prius lineup for 2019 is the addition of an optional AWD-e system which improves traction when the road surface conditions are less than ideal. AWD-e Prius models also include a revised battery that’s better suited for colder climates. Exterior styling has also been refreshed and now features slimmer headlights along with smoother angles in the sheet metal to complement the more subtle front fascia. Lastly, the trim level structure has been adjusted to better align with other model designations in the Toyota lineup. The 2019 Prius delivers good-looks to match its exceptional efficiency. Optional 17-inch alloy wheels add the right amount of attitude and ensure that this hybrid grabs attention wherever it goes. Bi-LED elements in the headlights, available integrated fog lights, and accent lights provide dynamic lighting on the Prius. These good looks offer more than just a sharp appearance. Increased body rigidity and a low center of gravity help make this the most agile Prius ever. The Prius also features a double-wishbone style multi-link rear suspension to help absorb bumps and stay planted to the road. A variety of bold, expressive exterior paint options help ensure that your Prius reflects a personality as unique as your own. Get ready to take your dreams even farther behind the wheel of the 2019 Toyota Prius, which helps make your trips easier on both your wallet and the environment. 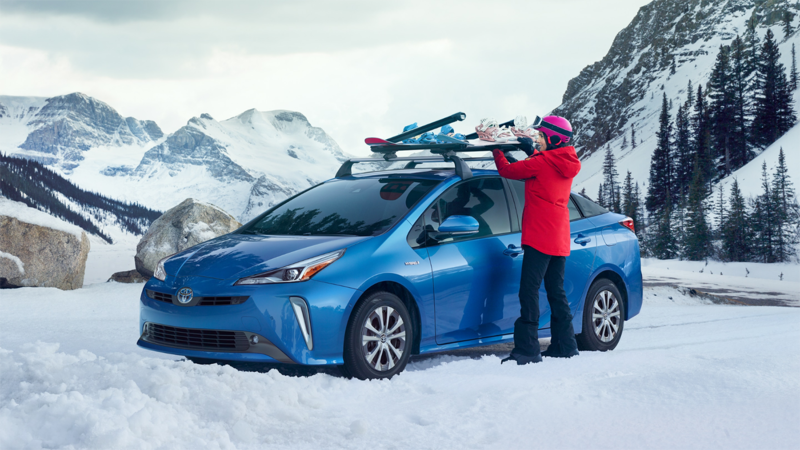 For the first time in America, the iconic Prius is now available with an optional AWD-e system which helps you confidently face the elements without fear. Thanks to an EPA-estimated 54 MPG city fuel economy rating**, the Prius helps turn even the shortest drives into a fuel-saving commute. Customize the 4.2-inch color dual Multi-Information Display screens to view tips to help you improve your ECO savings and real-time driving data. Selectable drive modes offered in the Prius let you drive with increased throttle response for additional get-up-and-go, drive solely on battery power for up to one-half mile under certain conditions, and maximize fuel economy. Standard 60/40 fold-down rear seats allow you to carry passengers, cargo, or a mix of both in the Toyota Prius. 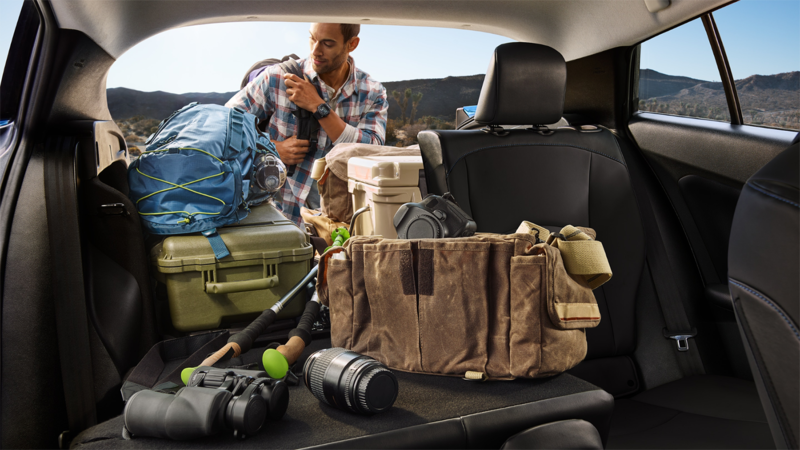 Cargo capacity is plentiful, with 27.4 cubic feet of space behind the rear seats and up to a maximum 65.5 cubic feet of total space with the seats folded. Available with SofTex®-trimmed heated front seats, winter mornings are no match for the Prius which brings added warmth with the press of a button. Everyone will always be comfortable inside the Prius thanks to the standard smart-flow climate control system with humidity sensor and pollen filtration mode. Use the optional power moonroof to get a stunning view of the city lights or fill the cabin with fresh air. 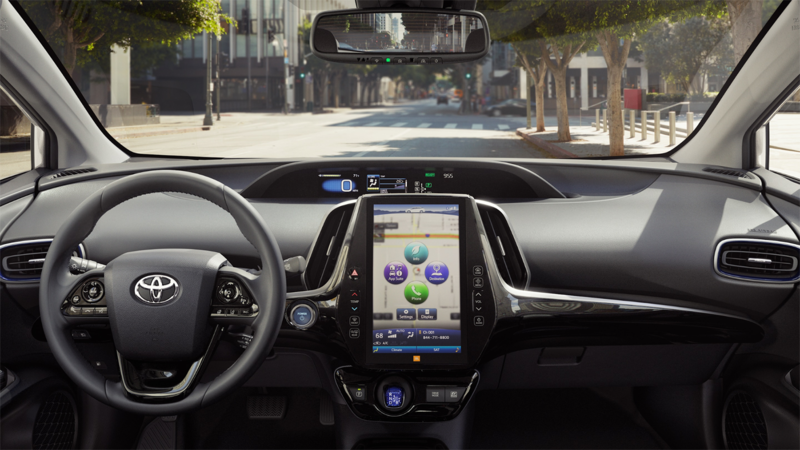 Parking the Toyota Prius or slowly pulling out of a space is nearly effortless thanks to helpful assistive technologies such as available Intelligent Clearance Sonar (ICS) and available Intelligent Park Assist (IPA). Wires are a thing of the past with optional Qi-compatible wireless smartphone charger which provides a non-slip surface to charge up while on-the-go. An available color Head-Up Display (HUD) uses aircraft-inspired technology to project vital information directly onto the windshield, keeping your eyes safely on the road ahead. With the standard Smart Key System, you can unlock the doors and even start the Prius with just the touch of a button. **2019 EPA-estimated 54 city/50 hwy/52 combined mpg estimates for Prius LE, XLE, and Limited. Actual mileage will vary.